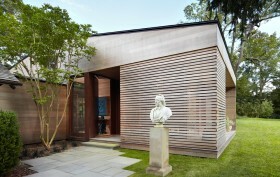 It must be hard to come up with a design to complement an existing log house, but Ryall Porter Sheridan succeeded with their Spanish cedar-clad Hamptons Pavilion. Interestingly, this material is neither Spanish nor cedar, but rather from an evergreen tree in the mahogany family. It’s also the traditional material used for making cigar boxes. But despite its confusing moniker, the paneling creates a structure that is both modern and organically connected to the surrounding landscape.